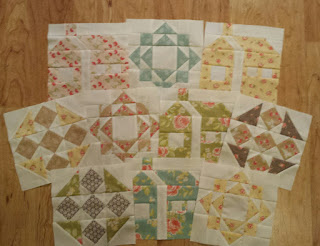 Introducing the Friendship block in our Crossroads Quilt Along journey. 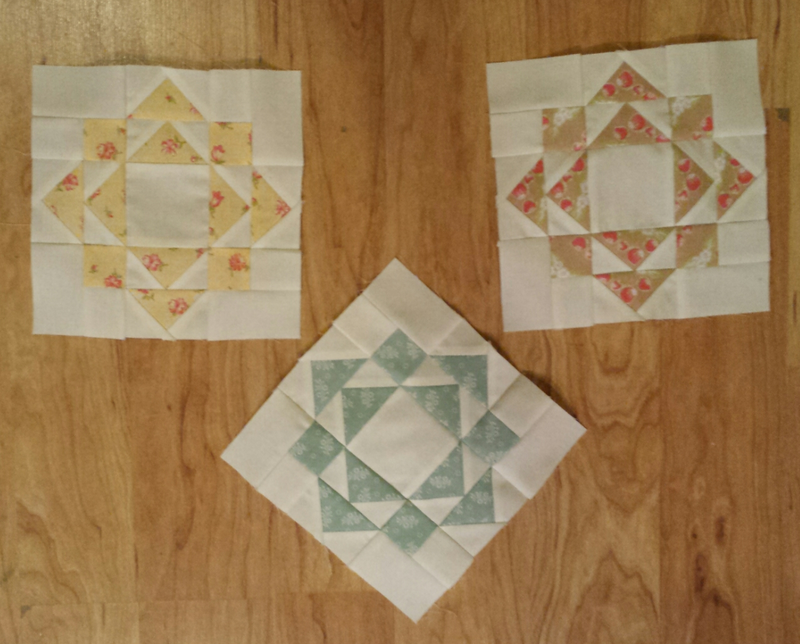 There were a quick and easy blocks to piece. 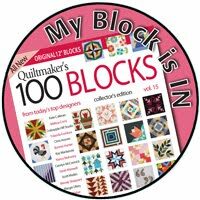 The Friendship block instructions were release April 15th. The next set will be released May 15th. 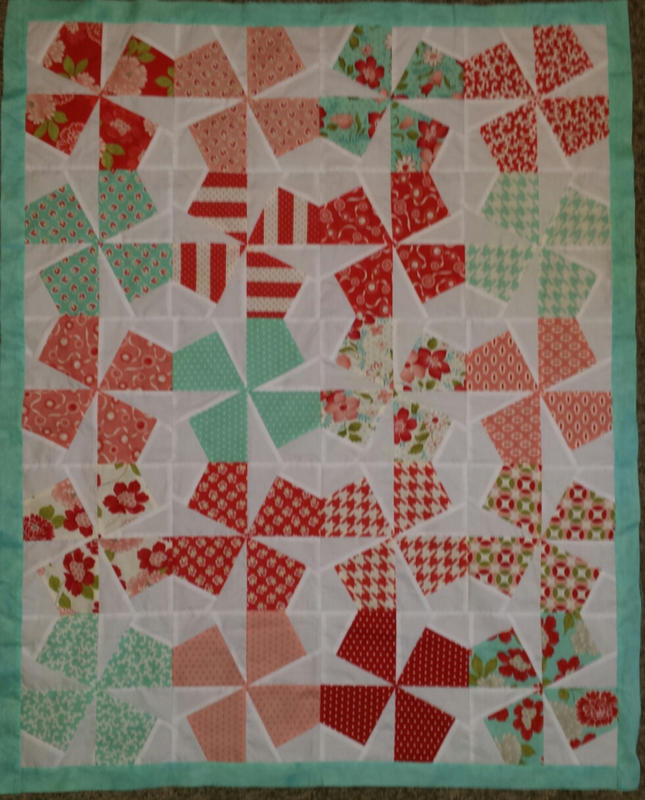 This quilt is offered for free from The Fat Quarter Shop, but they encourage you to make a $5 donation each month to March of Dimes. 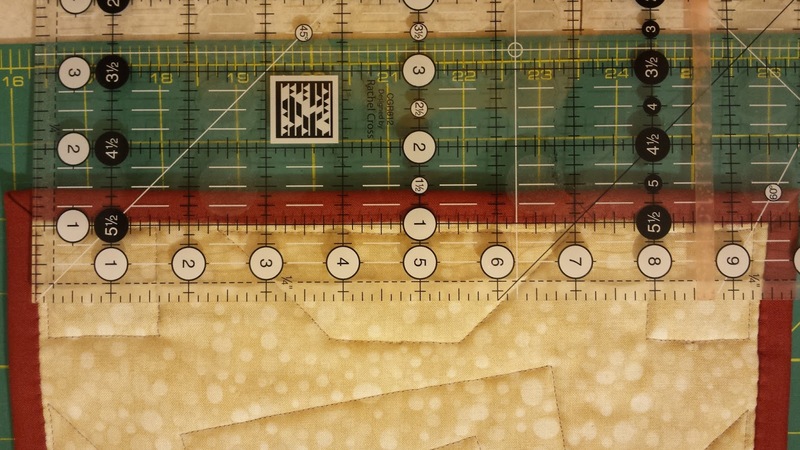 A beautiful quilt for a worthy cause. It's a win win. 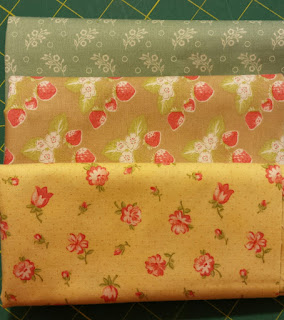 And the fabrics you get to work with Strawberry Fields Revisited. Ahhhh. 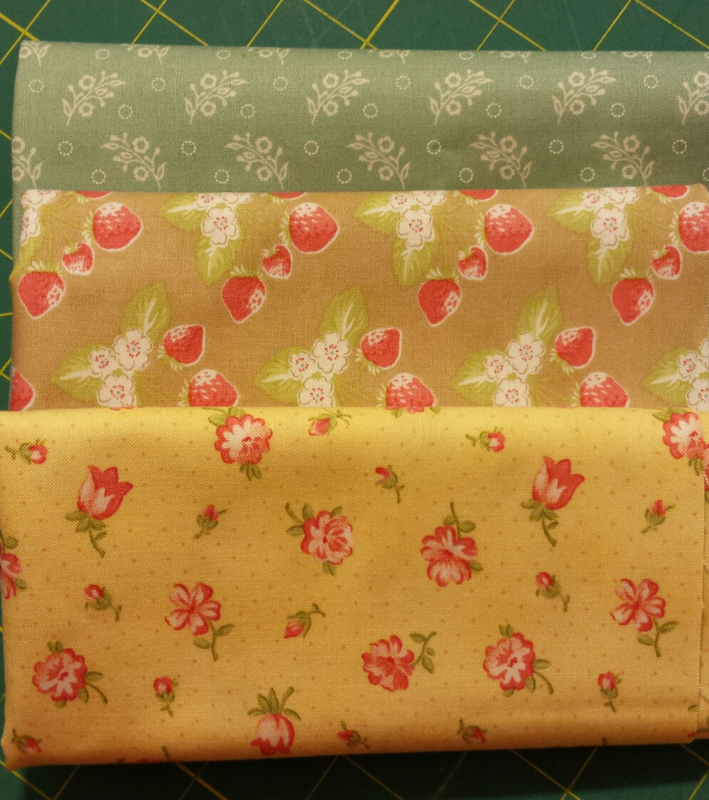 We used these three beauties along with our background fabric this month. I still just love those strawberries! 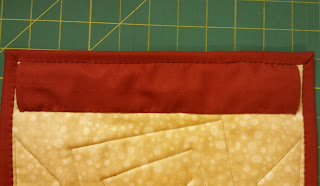 At this stage in my quilting journey I'm not a fan of pressing seams open, but that could always change, and I know that many quilters like it. I chose to not to do them this time around. 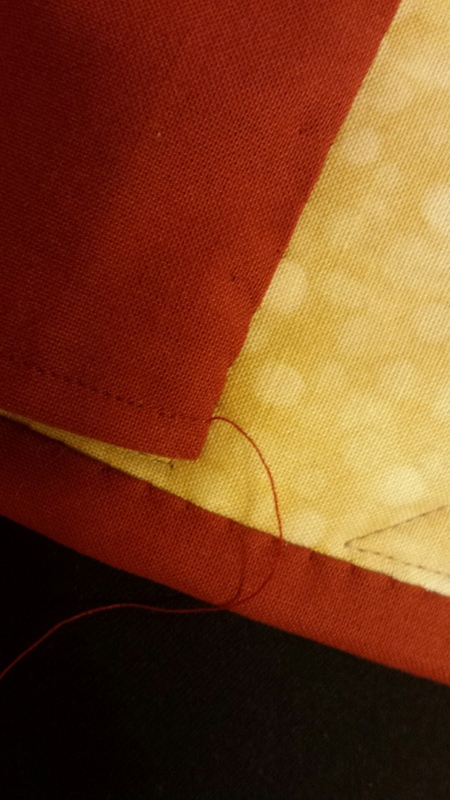 I get bulkier corners, it's true, but I like being able to match those seams up a little bit faster. 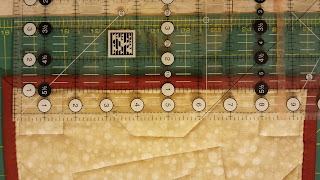 For these I pressed towards the beautiful prints. And for these I pressed towards the prints as well. I didn't grab a picture, but for the Flying Geese I pressed to the top goose. This makes it so all my seams can be sandwiched in together and I get nice points. 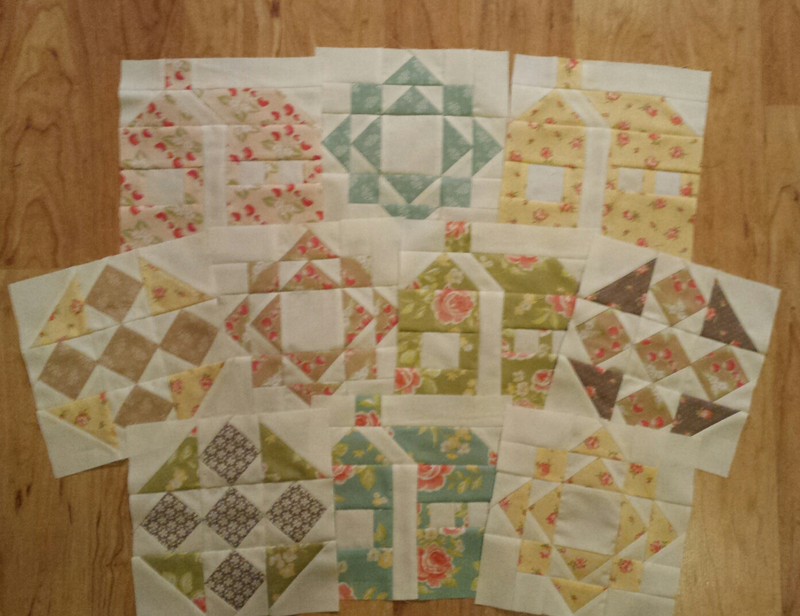 All the beautiful blocks so far. Don't forget to go to the March of Dimes site to make your donation! 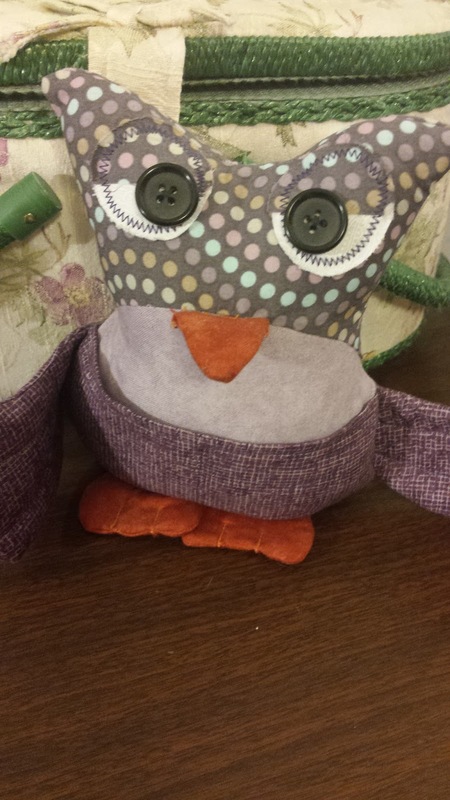 This Picked By Jen is the adorable Owl You Need Sewing Buddy from The Modern Tomato. Isn't she adorable??!! This was a quick sew. Aren't those nice? Stitching up something that you can enjoy almost instantly can be so rewarding. Especially if you are working on big projects that seem like there is no end in sight. Since my favorite color is purple, I had to use it for my buddy. After all, she is going to be hanging with me, right next to my machine, watching me, every day... with those owly eyes...ok, moving on. 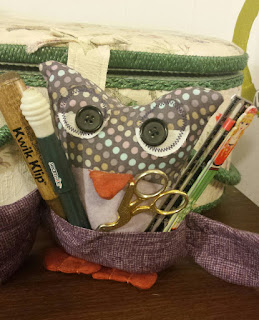 The instructions were easy to follow, and her tutorial is great. 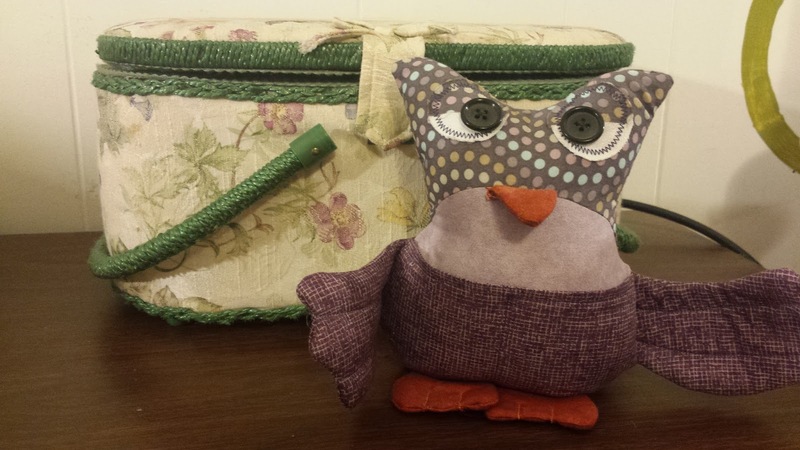 She has a couple different options for downloading the pattern, too. Nice and easy. And who couldn't use an extra set of hands, er, wings? I think I might go back and put a stitch in to hold her wings together, She holds a lot, though she might need a partner for a little help. 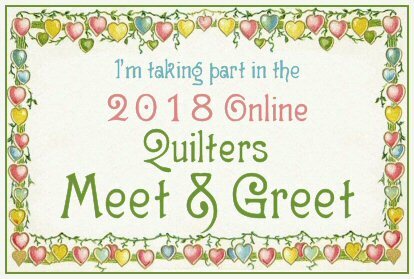 At the end of Shannon's post there is a link so you can check out all the little owl buddies helping out quilters and seamstresses. I hope you enjoy this Picked By Jen! 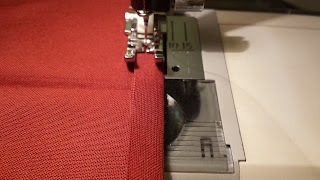 Today I am going to share how I make my hanging sleeves. There are different ways to do it, and this in NOT the way they like them done for shows. It is, however, quick and easy, which means I'm more likely to finish it and get on the wall, or in the case, the little hanging rack. 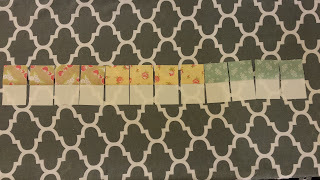 This little tutorial is for a miniature quilt. 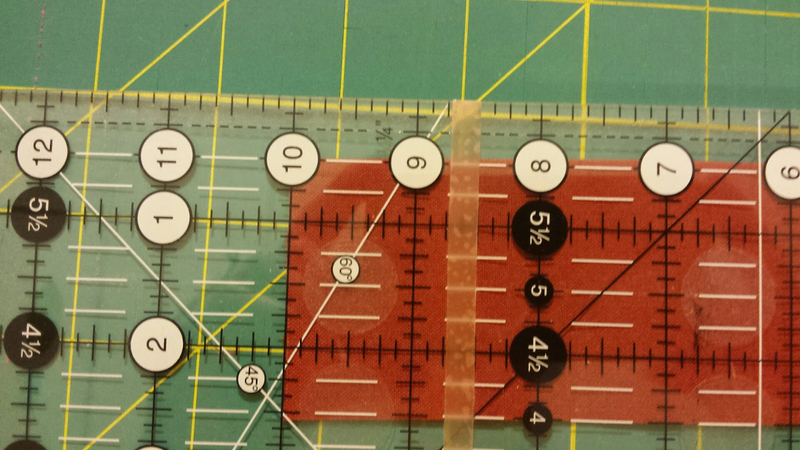 The first thing I do is measure. 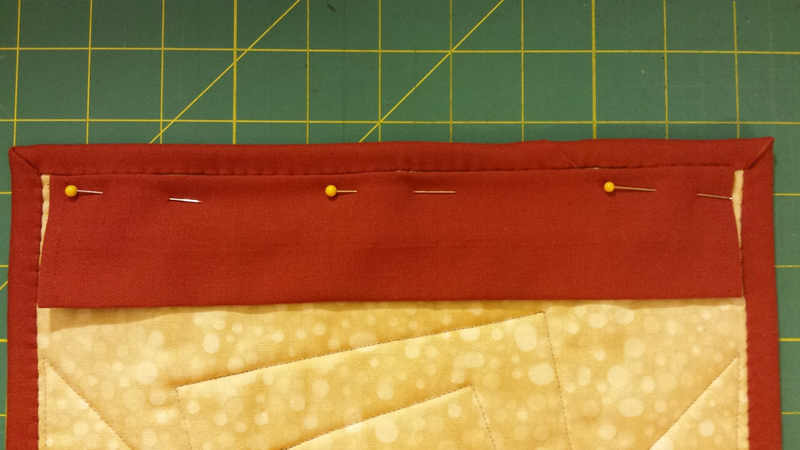 I am measuring the inside of the quilted piece, not the binding. In this case it is 9 1/2". 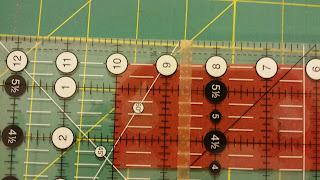 I need to add 1/2" for seam allowance, so 10". 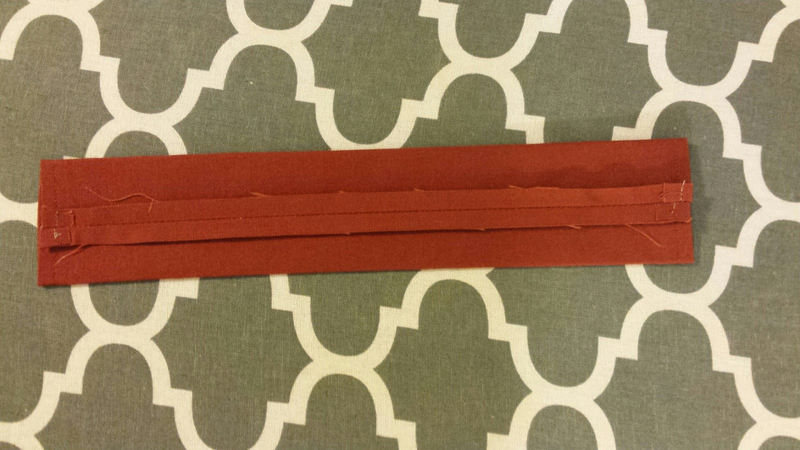 I'm going to find a scrap piece of fabric that is 2" wide and at least 10" long. Next I press a quarter inch seam on either end. I just eyeball this. It doesn't have to be perfect. Close enough is good enough in this case. 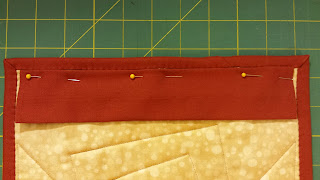 Using matching thread stitch each end. 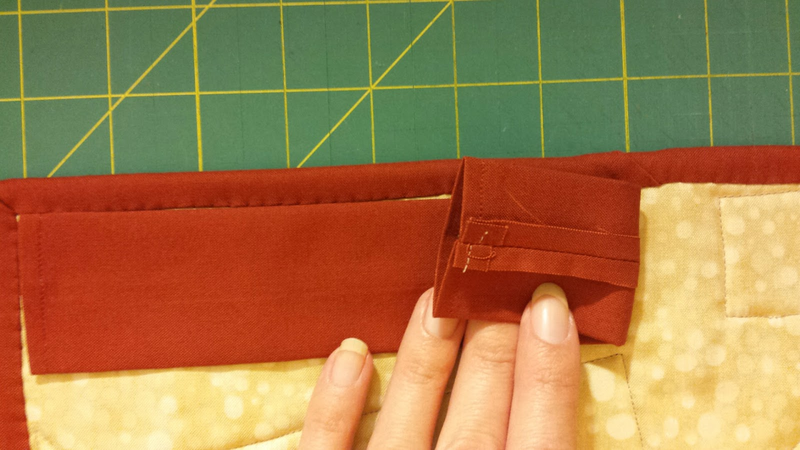 As you can see, my folded piece is a little wider then the 1/4", that's ok. I'm not going to worry over it. 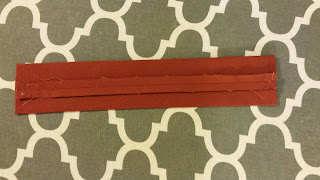 When both ends are stitched. 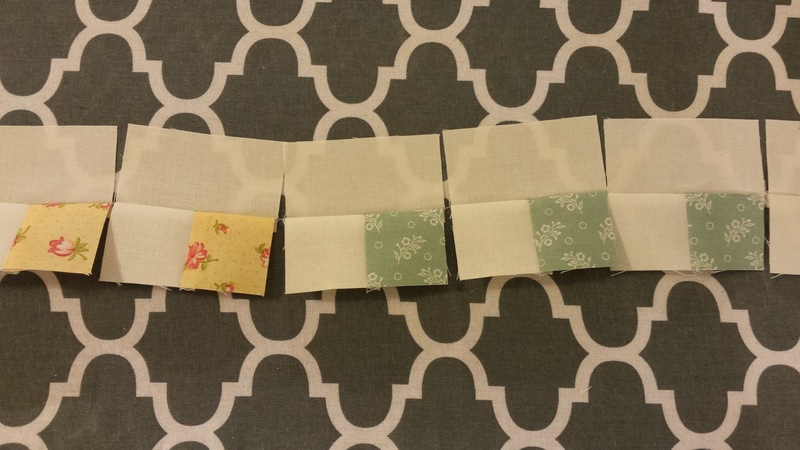 Fold your strip length wise with WRONG sides together and stitch. I like to start about 1/8" in from the end and back stitch, and when I get to the end I like to back stitch about 1/8" away from the end before clipping. 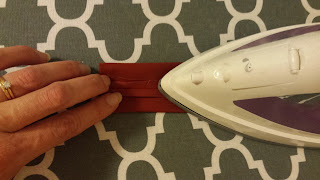 This keeps my threads from showing. 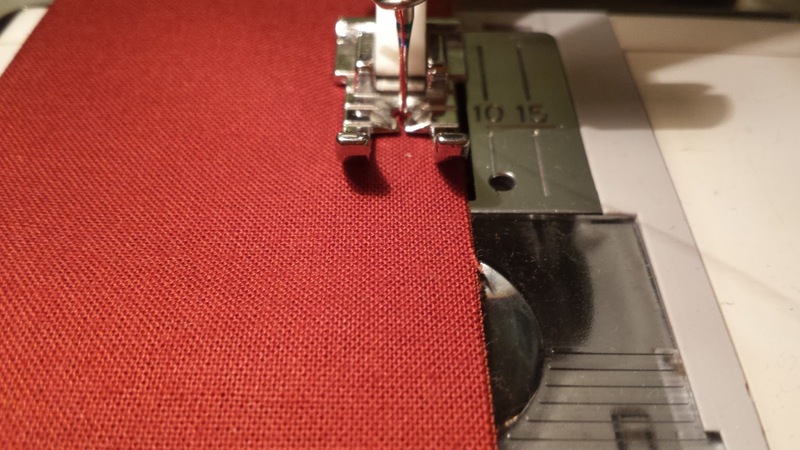 Next we are going to press that long seam open. 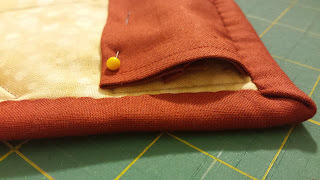 I maneuver my hanging sleeve so that the seam is centered. Your hanging sleeve is done. Now it's time to add it to the back. 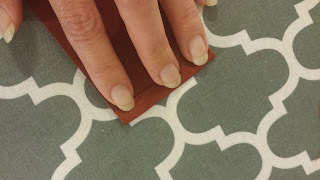 Making sure you are adding it to the top of the miniature, you want to place your hanging sleeve with the seam towards the backing. 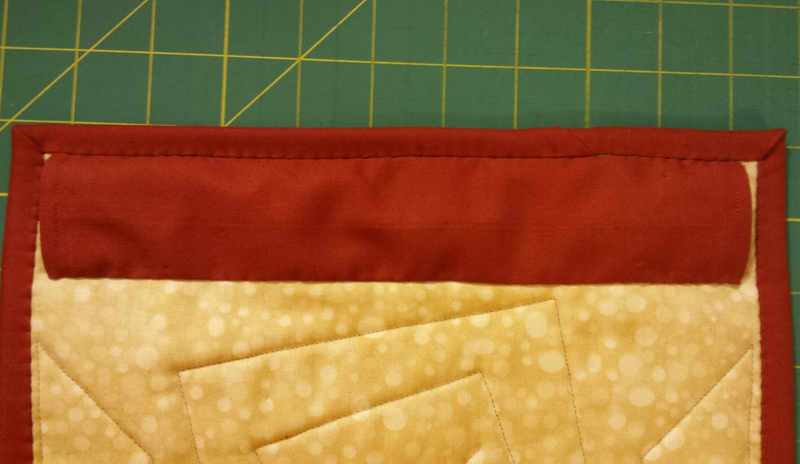 I like to start stitching along the top first. 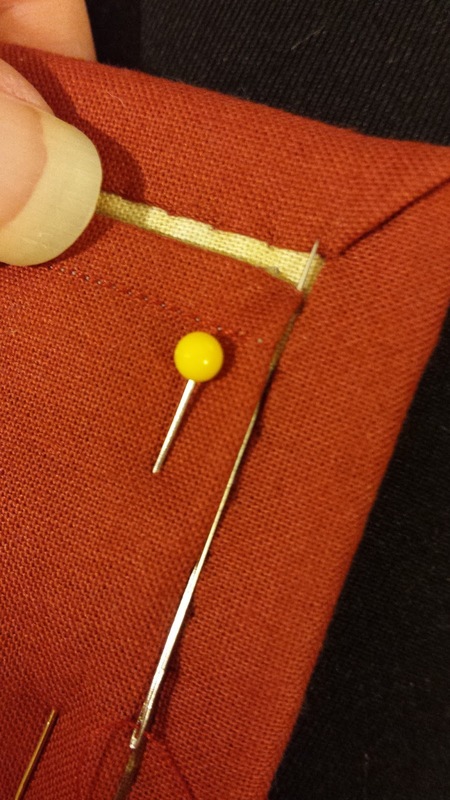 I pin to make sure the sleeve stay centered while I stitch. 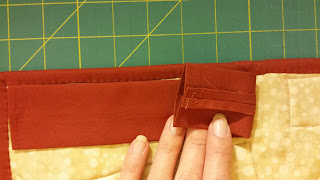 I start about 1/4" from the edge of the sleeve and come up right at the corner. I love my thimble for this and for binding. It really saves your finger. 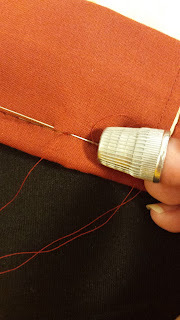 At the end I go straight down from the corner with the needle and come out under the sleeve to knot off. 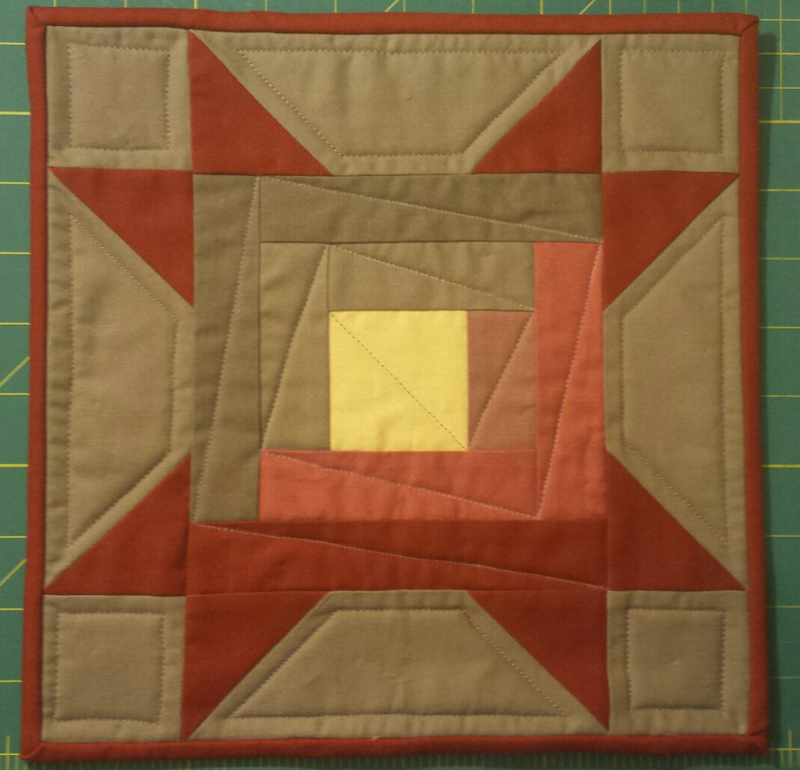 Next I pin the bottom. 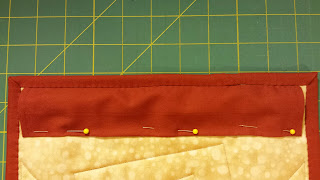 I like to push it up a bit to create a little give, pinning makes sure it's the same all the way across. 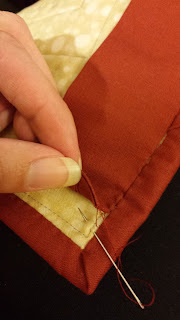 When I get to the end I do a back stitch in about 1/4", tie it off and bury the knot. 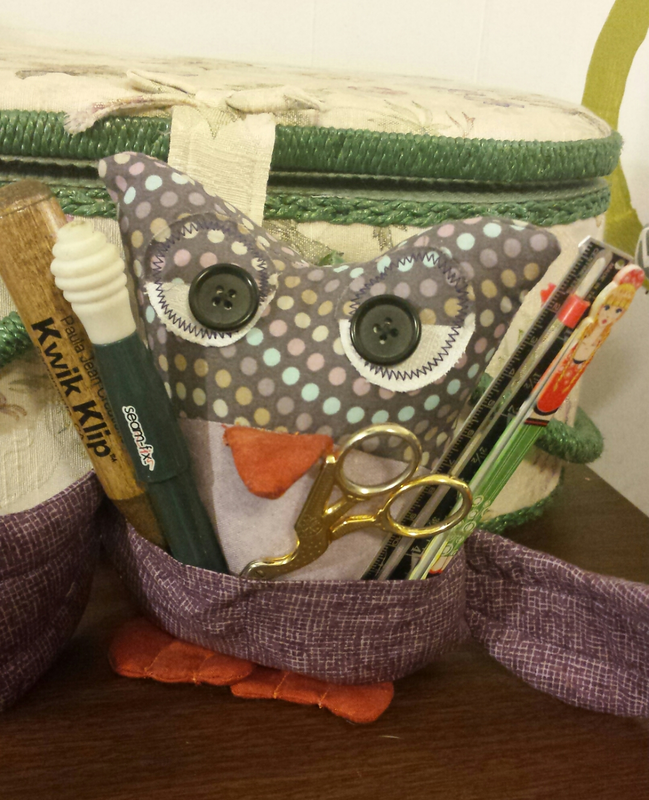 You are ready to show off your little miniature. 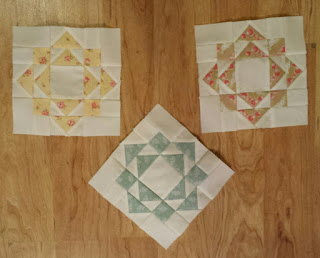 This 10" miniature is available with Patterns By Jen's 6th pattern: Star Light Star Bright Sampler. Coming sometime in May. 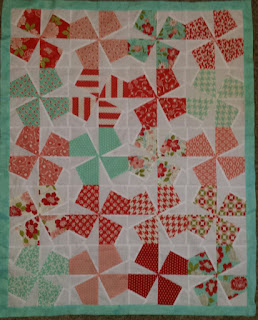 This pretty little quilt is called Carnival from Jaybirds Quilts. 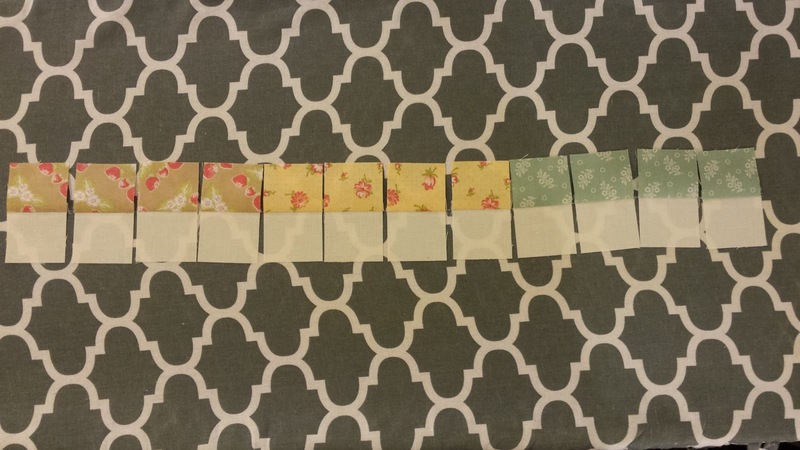 I pieced it all together, and then put it away. I just wasn't happy with it, though I couldn't put my finger on why. 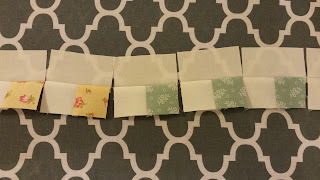 I finally decided I didn't like the inner border. So I'm changing it up. 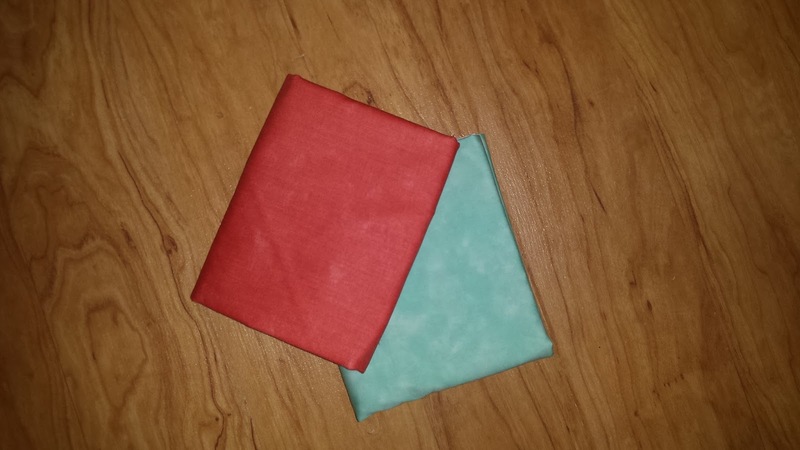 I have these two colors to chose from. The current border, though this same pretty aqua, is a batik, and I think it just doesn't work with the other fabrics. 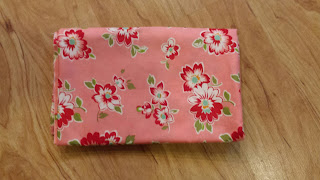 Once I switch that inner border I am going to use this pretty little print for the outer border. This is Scrumptious by Bonnie and Camille for Moda. I just love the green in these leaves. 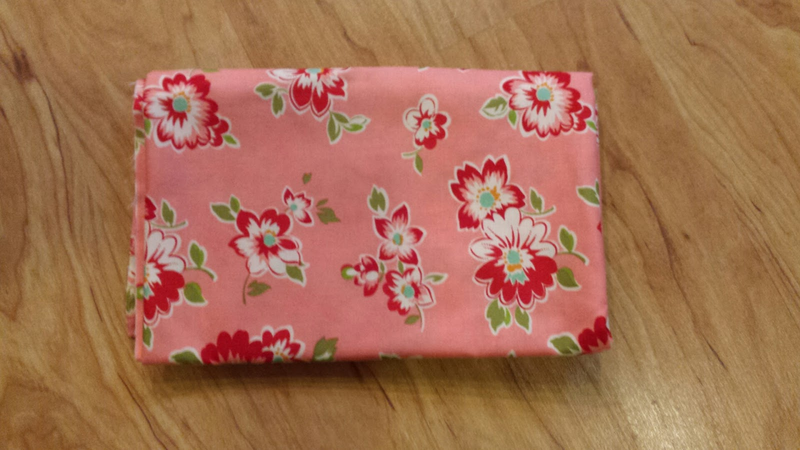 And this spring like print is perfect for these dark, rainy days. 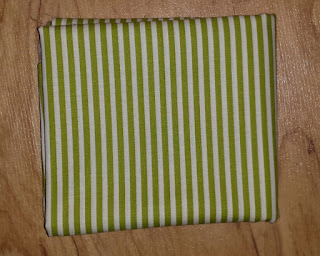 After I find the perfect backing I am going to bind it in this stripe, Marmalade by Bonnie and Camille for Moda. 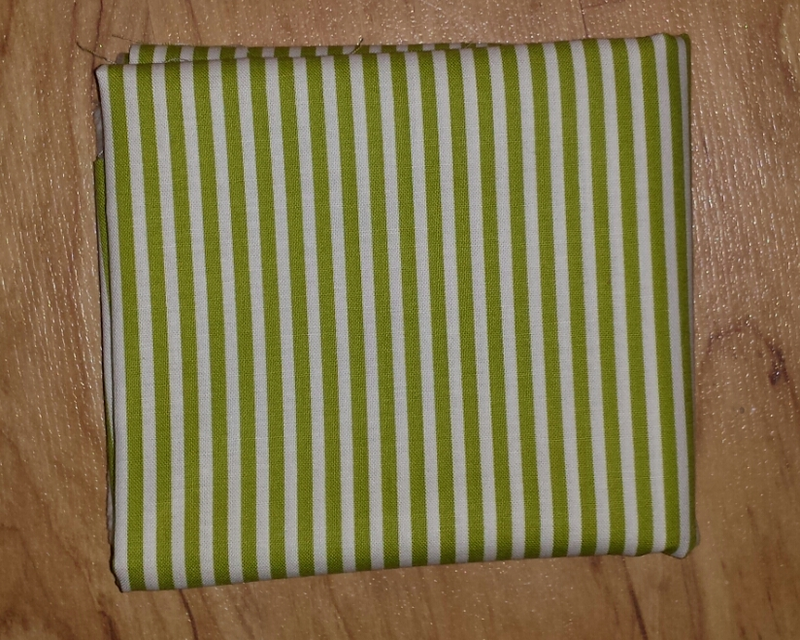 It will be my first striped binding, but I love this green. I think I may be ready for spring, and green things. Oh, look! Spring! 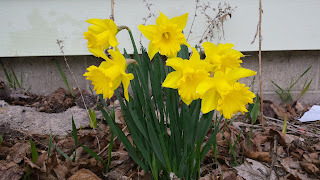 It's too cold and wet to clean out the flower garden, but that doesn't stop these beauties from defying mother nature. 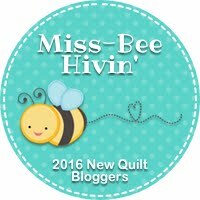 Do you have a quilt you put away, because you weren't feeling it? 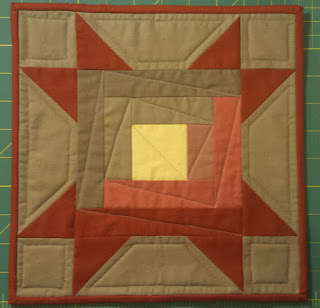 If you have pulled out a quilt to work on after putting it away, how did you get inspired again?